Welcome guest blogger, Jim Thorne! Kids really like to dream, and one thing they like to dream about is flying in space. I certainly dreamed about that as a youngster during the Apollo moon landings, which inspired me to become a space scientist. Recently, I combined my love of space travel with my hobby as a singer-songwriter, and recorded a CD of songs called “To Follow Apollo” about a boy and a girl named Tommy and Laura who explore space together. I’ve played these songs at assemblies for more than 2,500 elementary school students so far and it’s really fun to watch them light up as they follow the stories in their imaginations. 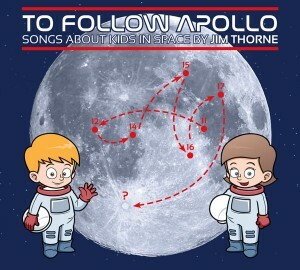 In the seven songs on the CD “To Follow Apollo,” Tommy and Laura learn about science and how to fly spaceships, and then leave the earth to visit many places in the solar system. In the title song, they return to the moon to find the original Apollo landing sites and go on to visit three more places where Apollo should have landed, had it not been canceled early. This way, the kids who are listening to the song can imagine that they could finish the original mission of Apollo by doing it themselves! In the song called “The Little Bear,” which is another name for the Little Dipper, Tommy and Laura go outside on a clear night to look at the constellations in the sky. They try to see as many animal constellations as they can, and end up finding 14 different animals during the song. A good friend of mine used “The Little Bear” to teach English to her 4th-grade students with other primary languages. I got to visit her class, and the kids sang my song back to me and made thank you cards with their drawings of Tommy and Laura looking up at the sky full of animals. It really touched my heart to experience this, and I believe the kids will remember the songs and the ideas. In “The Countdown Song,” Tommy and Laura fly to the planet Mercury to look for a crashed robotic space probe called “Messenger,” which was a real NASA program. The kids find the crashed probe on the surface of Mercury, but since Tommy’s rocket accidentally landed on uneven ground, they need to fix it before it can take off safely again. The kids both work together to solve the problem, then they count down from ten to one for the takeoff. In the classroom, I teach the chorus of the song to the kids first, which is just the numbers from ten down to one, and then they sing along at the right places in the song. This is very effective for keeping their attention because the students are directly involved in the story. 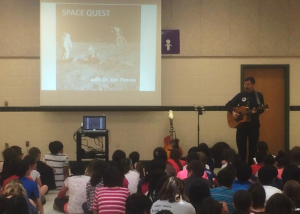 In addition to being a singer-songwriter, Jim is a published rocket scientist who shares his enthusiasm for space exploration by performing his original story songs for science programs in elementary schools. For all of Jim Thorne’s products on Songs for Teaching, click here! For more songs about outer space, click here!